Caveman English: Wondering about the Super/Full/Eclipsing Moon? Wondering about the Super/Full/Eclipsing Moon? 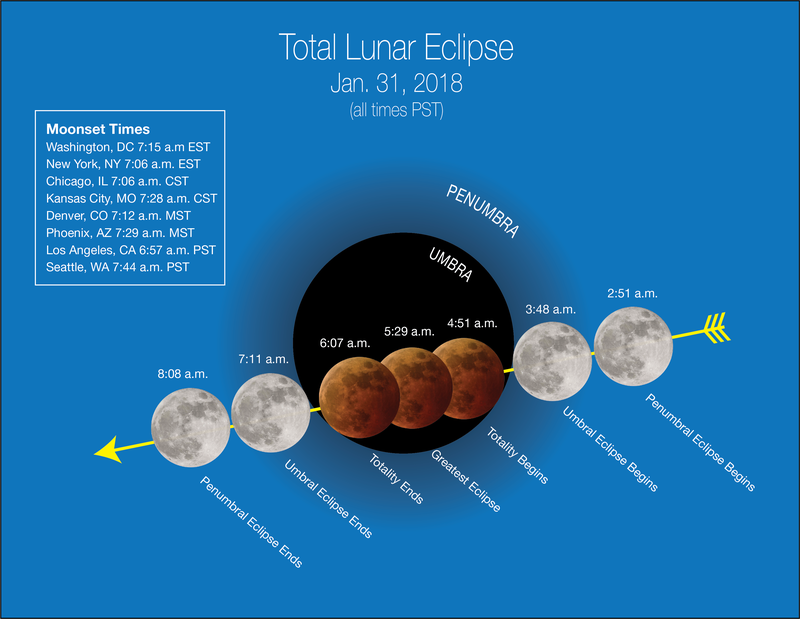 On January 31, 2018, in the early hours of the morning, there will be a full moon, a total lunar eclipse, a blue moon and a supermoon all at the same time. None of these events are all that unusual on their own. What is rare is that they are happening all together on one day. What Makes The Moon Look Full? Like Earth, the moon is illuminated by the sun. At any given time, half of the moon is bright and half of it is in darkness. The moon orbits around the Earth and as a result, we see different amounts of the bright side. About once a month, the moon is "full," which means we can see the whole face of the moon that is illuminated. 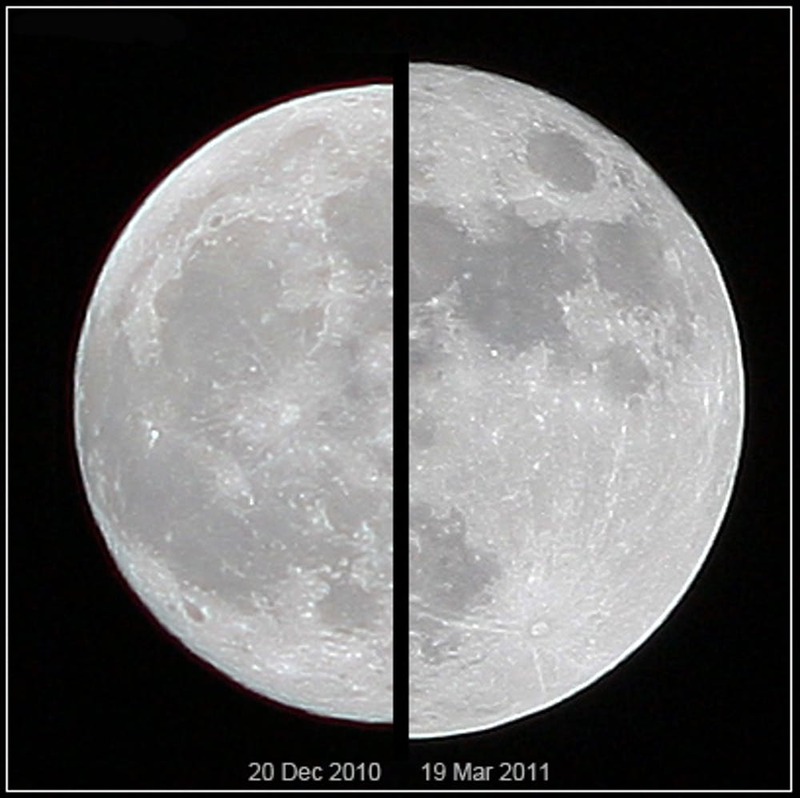 Full moons happen every 29.5 days, when the moon is opposite the sun and Earth is between them. January 31 will be our next full moon in the cycle. Earth goes around the sun tracing a path called an orbit, while the moon orbits around Earth. However, the moon's orbit is not on exactly the same plane. It is tilted by an angle of about 5 degrees. Because of the tilt, most of the time the moon is a little above or below Earth's orbit around the sun. Sometimes, however, the moon lines up directly behind Earth. When this happens, our planet stops the sunlight from illuminating the moon's surface. In other words, the moon passes into Earth's shadow. These events are called lunar eclipses, and they happen a couple of times a year on average. Lunar eclipses can only take place during a full moon. 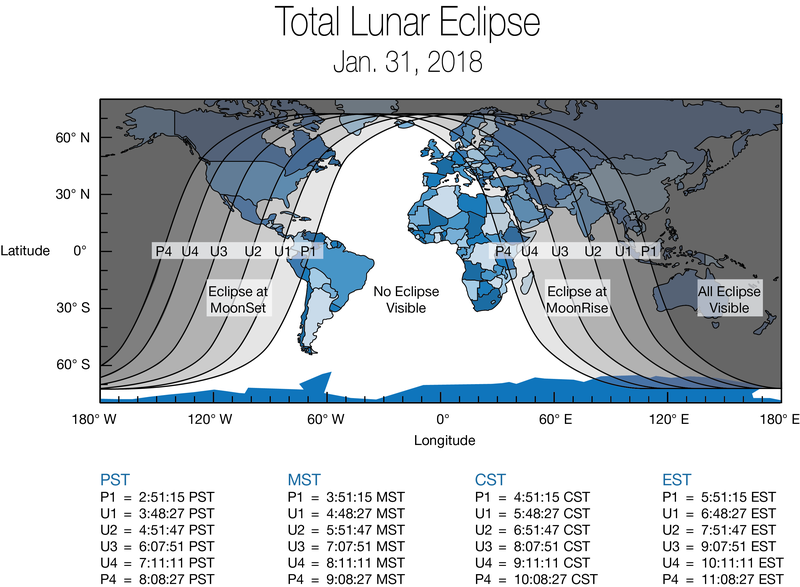 To see a lunar eclipse, you need to be on the side of Earth where it is nighttime. The eclipse on January 31 will be visible mostly in Asia, Australia, the Pacific and North America. During a total lunar eclipse, the moon is completely covered by Earth's shadow or umbra. Its surface becomes darker but it also gains a reddish glow. The red look is due to a process called Rayleigh scattering. Light from the sun might appear colorless, but it actually contains more colors than we can see. Rayleigh scattering happens when light passes through certain substances, like air or water, which make different colored lights go in different directions. When sunlight hits Earth's atmosphere, blue light gets scattered and makes the sky look blue. During an eclipse, this blue light does not make it through our air to the moon. However, some reddish light gets bent in the moon's direction and does make it through. That is what gives the moon a reddish glow. The January 31 full moon is also considered to be a "blue" moon because it will be the second full moon in January. A "blue" moon happens any time two full moons occur in the same month. This is possible because the cycle of a moon around Earth takes 29.5 days, which is less than a full month. Blue moons happen once every few years, which explains why the expression "once in a blue moon" is used to mean "rarely." On top of all this, the moon on the morning of January 31 will also be a supermoon. The moon's orbit is not perfectly circular, meaning that its distance from Earth changes as it makes its way around. The closest point in its orbit is called the perigee. Full moons that happen near the perigee are called supermoons. They look slightly bigger and brighter than usual because they are a bit closer to us. So, on January 31, be sure to look up at the early morning sky. You might catch a glimpse of a full, blue, red supermoon. Shannon Schmoll is the director of the Abrams Planetarium in the Department of Physics and Astronomy at Michigan State University. Mozart's Birthday! Saturday, January 27! Tell Your Math Teachers This Joke!